Through winding diary entries, A Change of Time pieces together the life of a schoolteacher after her husband, the town doctor, passes away. Set in rural Denmark in the early 20th century, the entries form an intimate portrait of a woman rebuilding her identity. Her thoughts unravel in sudden bursts, followed by quiet meditation or the rhythmic passing of each day. She writes, “Memory is like a sieve. Everything runs through it,” and indeed Ida Jessen’s prose conveys the constant feeling of falling through a sieve, grasping at each thought and gesture before they are lost. Set in rural Denmark in the early 20th century, the entries form an intimate portrait of a woman rebuilding her identity. Her thoughts unravel in sudden bursts, followed by quiet meditation or the rhythmic passing of each day. She writes, “Memory is like a sieve. 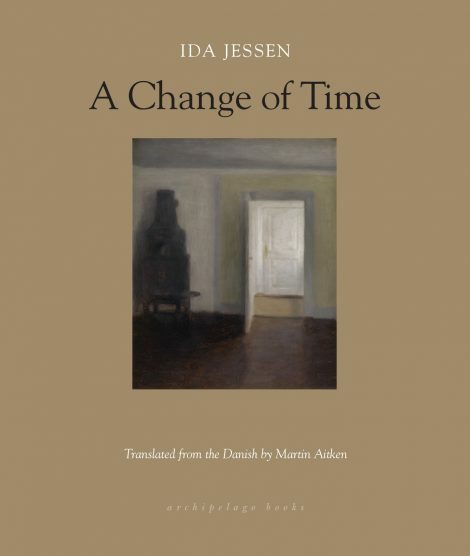 Everything runs through it,” and indeed Ida Jessen’s prose conveys the constant feeling of falling through a sieve, grasping at each thought and gesture before they are lost. With quiet adamance, the narrator gives the reader room to think and breathe. She casts a furtive light or an unsettling silence, both attempting to find her voice and yearning for complete solitude. Ida Jessen is widely considered to be the master of psychological realism in contemporary Danish fiction. Having made her debut with the short-story collection Under Sten (Under Stone) in 1989, Jessen’s breakthrough came with the trilogy: Den der lyver (The One Who’s Lying; 2011), Det første jeg tænker (The First Thing I Think Of; 2006), and Børnene (The Children; 2009). 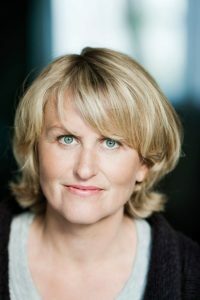 The latter earned her the Booksellers Prize, the Golden Laurel and a nomination for the Nordic Council Literature Prize. Her short story collection, Postkort til Annie (Postcard to Annie; 2013) earned her another nomination for the Nordic Council Prize. Jessen was recently awarded the 2017 Critics’ Choice Award (April 2018) for The Anagrams of Doctor Bagge. She is also a recipient of the Lifetime Award from the Danish Arts Foundation. Ida Jessen is a member of The Danish Academy and also translates the works of Alice Munro and Marilynne Robinson, amongst others. Other notable awards include: The Egholt Prize, The Albert Dam Grant, The Holger Drachmann Grant, The Jytte Borberg Prize, Søren Gyldendal-Prize, BG Bank’s Literature Prize, Karen Blixen/Isak Dinesen Award, and Danish Radio’s Best Novel. Winner of the Danish Broadcasting Corporation’s Best Novel Award 2016. 1. Early on, Ida Jessen’s narrator asks, “If one is offered a single chance to speak one’s mind, what does one choose to say?” How would you answer the narrator’s question? 2. Jessen often pairs such moments of reflection with a furtive light, a single flame, or in this case, “The lamp..in the window” (p. 13). What effect does this pairing of attempted speech and light have at the opening of the book? 3. Often, descriptions of the lush, heath landscape seem to match Jessen’s writing style. On page 88, she writes, “I went outside and heard on my way the strangest screeching song, a diminishing and then abruptly rising monotone that accompanied me over the flat, frost covered ground.” Her writing rises and diminishes, tracing and giving shape to the “empty and open” heath (p. 111). Were there other landscape descriptions that stood out to you? How is the landscape outside like the narrator’s inner landscape? 4. For the first half of the novel, Jessen’s lights and flames are always furtive, flickering, and silent. Even when she sets Vigand’s old clothing on fire, it dwindles for a moment and goes out. The narrator’s diary entry on November 10th boldly begins “It is slaughtering time” (p. 113). What kind of change in the narrator’s life does this moment mark? 5. The narrator says, “It felt like there was an intake of breath between the trees, a stillness of something momentarily held back, as if the trees were breathing” (p. 119). In this way, the narration is quite restrained, more often expressing what is held back and silenced, than what is said aloud. In what ways does the narrator break from this quiet restraint – when does she begin to exhale this deep intake of breath?